This is going to be quite the Fall season for www.apple.com. According to Apple honchos, these announcements are going to be major and some of the most innovative to date. Rumors of two new iPhones, IWatch, Near Field Communication technology (NFC) are nearing confirmation, according to iPhoneInCanada.Ca. I am squealing like a little girl except I am far from the “little girl” thing. Really far. Hence the name for this blog. Anyway, mark your calendars for Tuesday, September 9th and try to figure out the significance of the tag line, “Wish We Could Say More”. Oh those Apple geniuses – they never stop toying with our minds, do they? The media event will take place at the Flint Center for the Performing Arts in Cupertino at 10AM PST. Apparently, Walt Mossberg tweeted that this is where the first MAC was introduced. 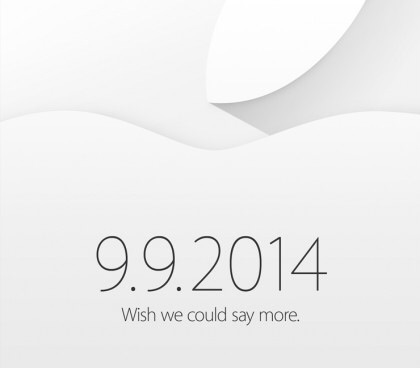 Will we be once again be wowed by the unveiling of new products destined to take over the technological world? And, do those numbers in the picture above mean anything? Not sure. What do you think? I am more intrigued by that tagline. Thanks again to IPhoneInCanada.Ca for being my guiding light. Life can be frantic at my end. I am a geek, but also a grandmother. The latter takes up more of my time and happily so. However, I promise to be more consistent with my articles during the 2014-2015 season.